No matter what sport you participate in, if you want to progress to a competitive level then you should seriously think about joining a club where coaching and training is given. While it is possible to reach a competitive level on your own, guidance in training programmes, nutrition and techniques specific to your sport will make you more competitive. No matter what the sport is you choose to compete in a certain level of fitness will need to be achieved and maintained if you want to be competitive. For aerobic athletes (running, swimming rowing etc) it is accepted that weight training combined with the correct strength training can lead to improved performance. These day's performers in most sports will do some weight training. Before the Commonwealth Games held in Manchester in 2002 the even the England Crown Green Bowlers who were competing had undergone weight training as part of their programme to improve performance. When using weight training as part of your exercise programme it's important that the areas of the body targeted for exercise are relevant to your specific sport. Weight training for speed and endurance can only help so much, as athletes will need to use drills and exercises specific to their sport to get any benefits in their performance. 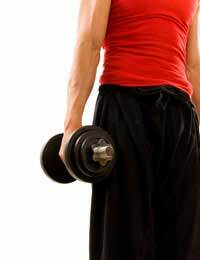 It may seem unlikely to you that weight training could improve the performance of a cricketer, a tennis player, or goalkeeper, where speed of movement and reflexes play a large part in the sport. While weight training won't play a part in quickening reflexes, it will strengthen tendons muscles and ligaments, providing an increase in overall strength that will help protect the athlete against injury. Weight training will benefit anyone who is involved in an endurance sport making them stronger and helping them become faster for longer. There has to be a point to training. Training must be a means to an end in helping you achieve your target. You might want to run a marathon, but if you've never exercised for years, or never run more than 100 yards, you aren't going to achieve your goal straight away. Think small- try and achieve short term personal goals. Rather than going out and trying to run twenty-six miles, try going out and running for twenty minutes initially. Gradually you can build up the length of time you are able to run, and the speed at which you can operate. Set yourself a training programme with realistic daily or weekly goals. Achieving these smaller targets gives you confidence and you can see the results in your improvement each week which will spur you on to do better. As well as preparing the body for competition, it's just as important to train the mind. Mental toughness plays a large part in a lot of sports. Sport's psychologists are involved in many sports where they work on the mental aspects of preparing for competition. Exercises in concentration, focussing the mind, self-belief and being able to psyche out an opponent and make them feel inferior can all be taught, to help improve an athlete's performance. Long spells of concentration are needed in some less physically demanding sports like snooker or darts. Having the ability to focus yet stay relaxed will help performances improve in these sports. In a sport like F1 Motor Racing you need to be extremely physically fit and combine that with a supreme level of concentration. One error in judgement or one lapse in concentration could have fatal consequences, yet a F1 driver cannot think about the consequences of making a mistake or he would not be able to drive to his best-that's where the mental toughness comes in. Athletes gasping for breathe, muscles burning, can't stop and give up. They know they are going to hurt during and after a race but their mental preparation and strength will see them overcome the physical pain. Will power also plays a part in the training process. Many sportsmen and women have to train at unsocial hours. Their social live can take second place to training or competing sometimes. When friends may be going out on a Friday evening to a party or nightclub, an athlete may be competing the next day and will have to rest. You can't perform to your best if you've had only a couple of hours sleep. If you are dedicated, willing to train hard physically and mentally, willing to listen and learn and are able to enjoy training and competing, then you should be able to achieve your goal of competing competitively in your chosen sport. This articale can really help people with losing weight.